Our Students Really Love Us! See for Yourself. Sign up today for our next SEO Training class and receive 6 Month’s of ongoing Mentoring upon completion. Classes Start: Aug. 11 | Oct. 6 | Dec. 8 Limited Seating still available for theclass. Are you an existing Search Engine Optimization Professional who is looking to enhance your skills or learn the very latest SEO techniques? 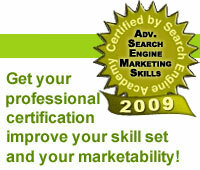 Would you like to obtain your SEO Certification in Advanced Search Engine Marketing Skills? Have you been looking for somewhere to take a hands on SEO class that teaches you the latest techniques to get your sites listed at the top of the SERP’s? Are you ready to take your web sites to a whole new level! No question goes unanswered at our hands-on workshops. Join us for our next SEO Training Course. Our SEO Training Workshops were developed and are continually updated by industry guru’s at Search Engine Workshops and Search Engine Academy. These are the premiere onsite SEM Training workshops in the world! What if you could attend a Search Engine Marketing Workshop with others at your own experience level? Build genuine top placement skills and expertise in a very short period of time. Learn all of the up to date influences to building genuine relevancy for competitive keyword phrases. Each SEM training class has limited enrollment to ensure a small, personalized class. Experience a totally different “stress free” approach to search engine optimization. Enjoy step by step, personalized, hands-on instruction delivered to you by SEO industry leader Steven Scott. This SEO Workshop is focused on teaching you the full spectrum of search engine marketing and on imparting genuine skills to each individual student. Build your skills by studying our high performance examples. Refine your SEO skills with hands-on practice under our direction. Many of our students walk away with almost a “life changing” experience. Their outlook and goals are totally uplifted and changed, and they know that they can now achieve success . . . without any tricks and cheats. Plus enjoy a 6 month Mentoring Program after class is over. Can you really afford not to attend these SEO Training Classes?